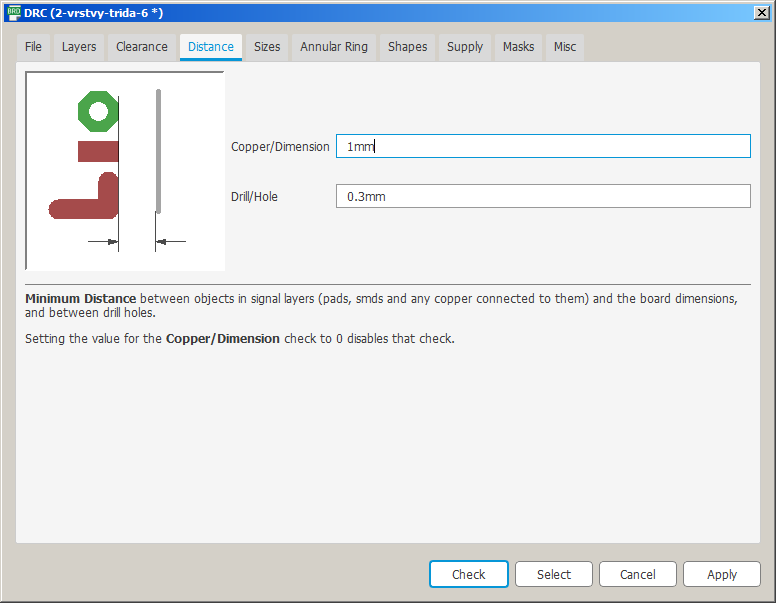 MUFF WIGGLER :: View topic - allpcb/pcbway DRC spec for PCB edge clearance? allpcb/pcbway DRC spec for PCB edge clearance? Eagle has a setting for PCB edge clearance called "Copper/Dimension"
that limits how close can pads and traces be to the edge of the PCB. What is this value for PCB manufacturers like allpcb, pcbway or similar? do the chinese pcb fabs print silkscreen on the top side only or also bottom for the cheapest prototype boards? I guess that depends on which one you refer to, but I generally use Seeedstudio fusion, which I guess qualify for cheap Chinese, and they have supported everything I throw at them - silk screen to/bottom, milling, etc. Just thought I'd add that I've been using PCBWAY for the last 6 months on a project and I've been really happy with them even though they are a "cheap" manufacturer. If you design your project in Eagle, they have a link that will convert your eagle project into the specific files they need to fabricate. thanks, do you have a thread with photos of your pcbs? if not, could you post some here? do they print the silkscreen on both sides for you? I disagree on both points. I've had more bad etches on OSH park boards than anywhere else and they were never some crazy pitch or anything, just defective parts. Their eagle bot isnt very flexible, I stopped using that a log time ago and always send gerbers. I've been using OSH since the Dorkbot days and they kinda pioneered the cheap proto thing but times have changed. You can get better boards (HASL plated, multiple colors, etc) in a fraction of the time (JLC is 5 days to my door) and for less.. I have not used PCBway myself but I believe that for instance the Mutated PCBs sold at Modular Addict are fabricated there. I have had boards made by allpcb, jlcpcb and dirtypcbs all without issue and all with silkscreen on both sides. Got some from JLCPCB and the also print silk on both sides.